Euro started forming first descending impulses. We think, today the price may form the third one. Judging by the structure of this movement, we shouldn’t expect a deep correction. 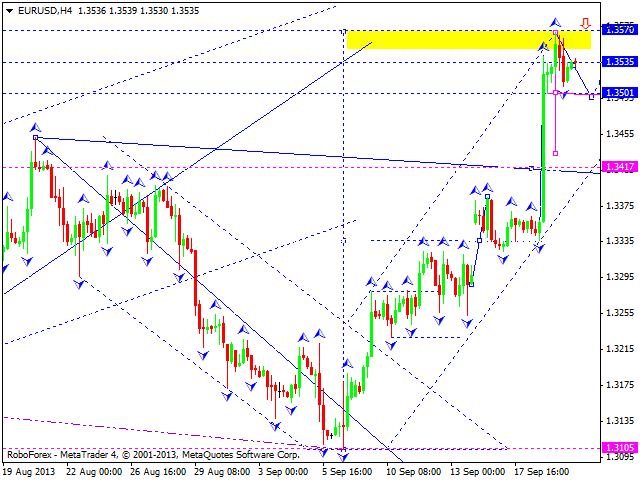 Later, in our opinion, the pair may reach a new maximum and then start moving downwards to reach the target at 1.3417. Pound started forming a descending structure. 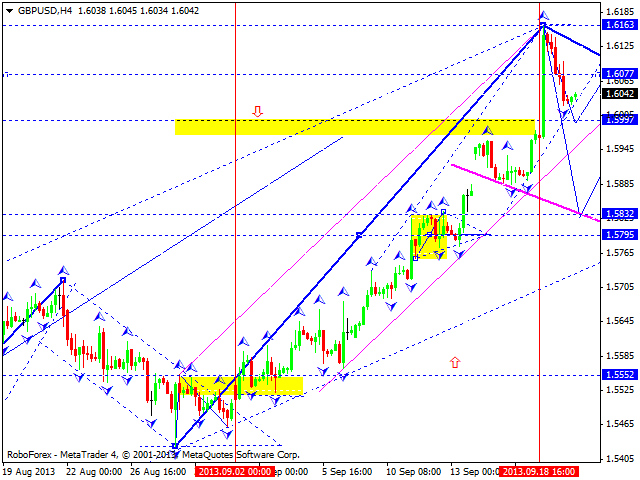 We think, today the price may form one more descending impulse, the third one, towards the level of 1.5997. This descending movement may be considered as the first wave of the correction. Later, in our opinion, the pair may move towards the target at 1.6077 and then form a descending correction to reach the level of 1.5550. Franc is still consolidating near its minimums; the market hasn’t been able to form a reversal pattern yet. We think, today the price may reach a new minimum and then start a new correction. The USD/JPY currency pair completed its first ascending impulse. 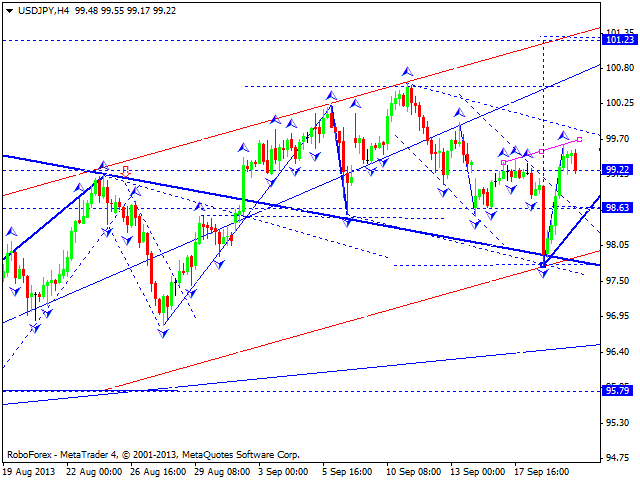 We think, today the price may fall down towards the level 98.75 and then start forming head & shoulders reversal pattern. The target is at the level of 101.20. After finishing the right shoulder, the pair may start growing up again to break the top of the first impulse at 100.40. 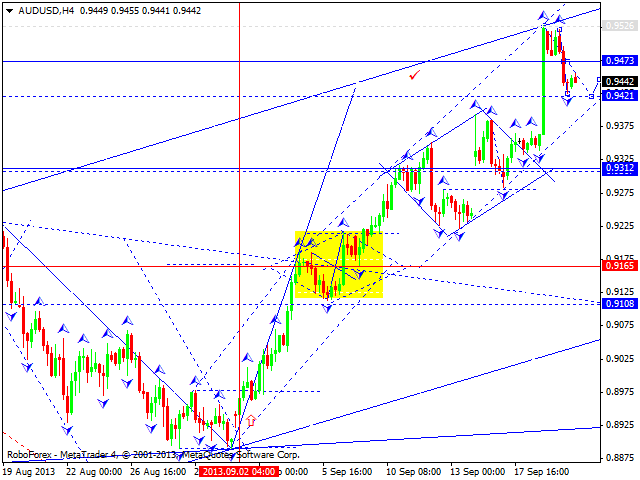 Australian Dollar has already formed two descending impulses and is expected to form the third one. 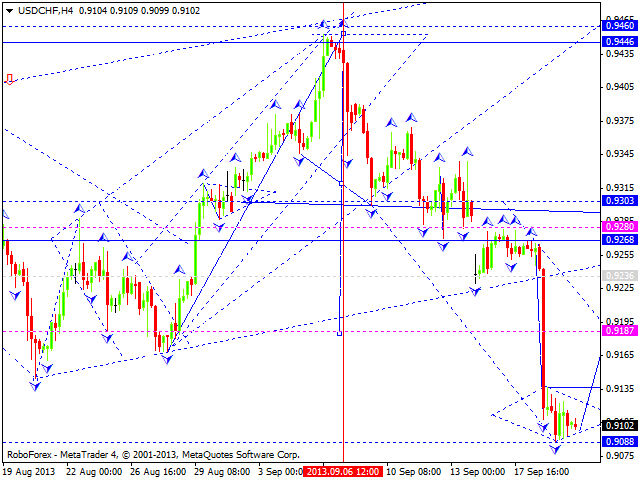 We think, today the price may reach the target at 0.9420 and then return to the level of 0.9473. Later, in our opinion, the pair may start a deeper correction. 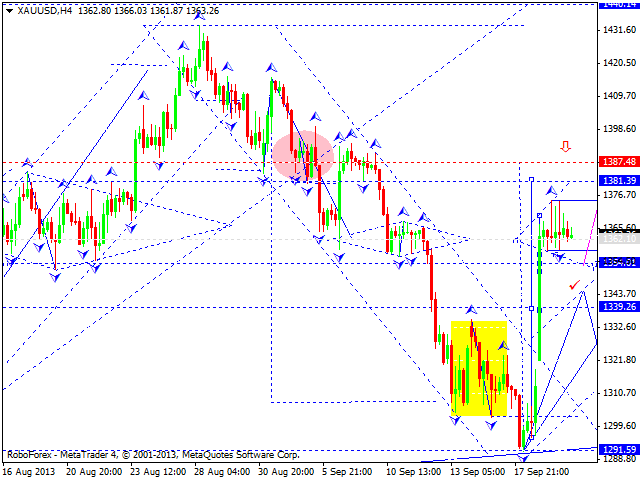 Gold continues consolidating. We think, today the price may expand its trading range downwards to the level of 1354 and then upwards to the level of 1381. Later, in our opinion, the instrument may fall down again to reach the level of 1340 and then grow up towards the level of 1387. Thus, the market is forming divergent triangle pattern.